A popular black stemmed bamboo, Phyllostachys nigra is ideal for use as a feature plant or screening. The narrow, evergreen foliage (up to 12cm long) sounds appealingly like trickling water when a breeze passes through it. Native to China, this Black Bamboo is great for creating an oriental themed garden or tranquil zen garden, but looks splendid in any garden. 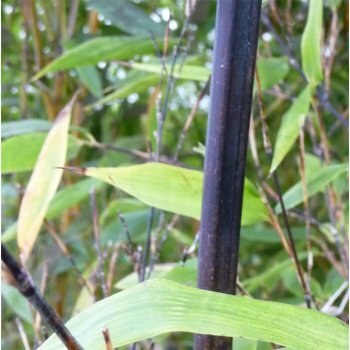 Phyllostachys nigra is a nice bushy Bamboo that will grow to 3 x 2 metres in 20 years when given a moist position in full or part sun. It is a clump forming variety of Bamboo plant and is less prone to spreading out of control. Our pot grown Black Bamboo plants can be planted at any time of the year. Prepare your planting site by removing all weeds and grass within a metre of your desired planting hole. Dig a square hole as deep as your root mass and approximately 2x as wide. We recommend lining the hole if you want to prevent the Bamboo from spreading. To help the Bamboo establish more effectively, we advise sprinkling root grow in the hole, especially if you have poor soil. Gently loosen the roots and place into the planting hole. If your soil is poor, mix 50% of the original soil with 50% high quality compost, fill in the hole and firm around gently. Make sure not to bank the soil up around the collar of the plant. If you’re planting in spring or summer, water well and regularly for the first few months. Make sure to keep an eye on young Bamboo and increase watering if there are extended periods of hot or dry weather. If you’re planting in autumn, you may only need to water your tree a little. Bamboo plants do not like sitting in wet soil for long periods of time, so avoid over watering. Once planted, keep the area free of competing weeds and grass for the first couple of growing seasons. Using a glyphosate based weed killer or installing mulch matting and bark chips will aid in this. A good tip for bamboo plants is leave some of the fallen leaves around the base of your plants as they contain silica which improves strength and stability. Black bamboo plants are very low maintenance. They simply need tidying up in spring by cutting weak or damaged canes down to ground level using secateurs.